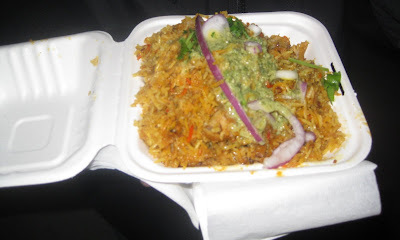 This roving restaurant has affordable Indian street fare, with some being worthy food options and some definitely not. Oh, and it DOES serve tomatoes. The Details: It irks me that the No Tomatoes! Indian street fare food truck serves food that has tomatoes. Why the misnomer, guys? No Tomatoes! should take a page out of the menu of The India Restaurant and just name itself what it is (No Tomatoes: Just Kidding?). For you tomato-haters out there who were considering flocking to this truck, you're actually safe except for the tikka masala. 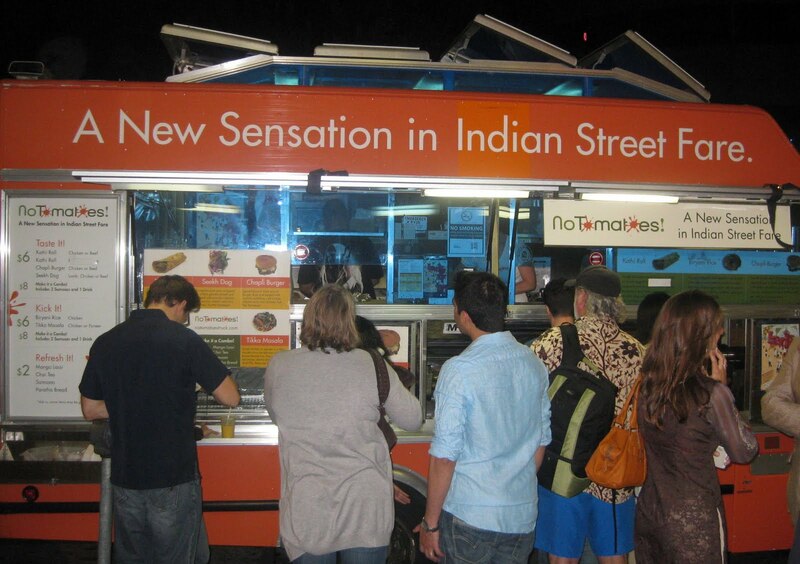 Name notwithstanding, I love the growing Indian food truck trend. Gotta love that entrepreneurial spirit and adaptability. Service at this truck s friendly, moreso than at some of the other ones. The food was served quickly, literally less than a minute after we ordered. The only aggravating thing customer service-wise is it charges $0.50 extra for credit card payments. I had enough cash on me but didn't want to juggle with the change, so I paid with a credit card anyway. Boo to losing some laundry money. Like most food trucks, it has a limited menu, and it's affordable. Prices range from $2 (drinks) to $6 (most items) to $8 (combos). Portions are small though, especially the samosas. I got the Seekh Dog with lamb (also available with chicken or beef). 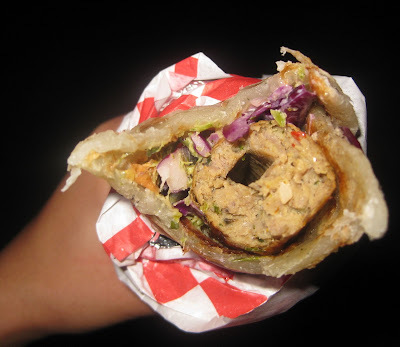 which is meat wrapped in paratha and topped with coleslaw, red onions, cilantro, and mint chutney. I appreciated the crunch of the vegetables. This item was spicier than I expected it to be, but I'd still recommend it. The inner paper wrapping was frustrating though. I was so hungry and the paper wouldn't roll down! At one point, I was seriously considering biting into the paper--ha! I paid $2 extra for the combo, which included two small Samosas and a drink (either a bottled water, which I got, or a soda. If you want an Indian drink, like a Mango Lassi or a Chai Tea, that's $2 on its own). 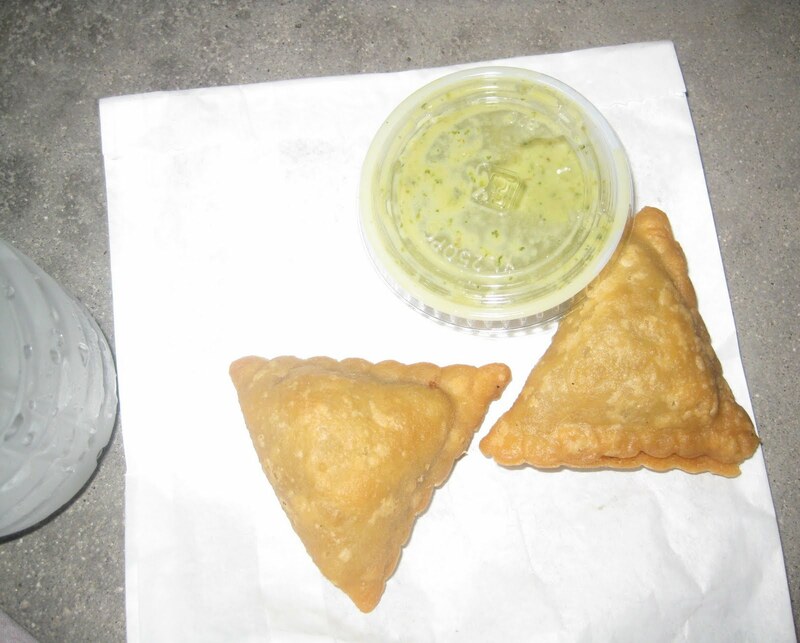 The dipping sauce that comes with the samosas is a nice truck. Now the main reason this food truck lost so many peppers in its rating. The biryani was wayyy too spicy! I mean, it was basically inedible. Nick bought this for $6, and I noticed he kept grabbing my water bottle after every bite. I asked him what was wrong. He let me taste it, and I knew we'd have to throw it away. It was so spicy -- wow. Trying my best to overlook that, the rest of the flavors taste-wise were fine, but smell-wise it had an odd, unplaceable smell. It came with chicken (no choice with the meat), though the chicken pieces were really small. I gave Nick one of my samosas, and sadly that was pretty much his dinner for the night. The line for the food truck was too long for me to be able to let them know about the biryani problem or to find out if we could replace it with something else. Bummer. What's your favorite Indian food truck? Have you eaten No Tomatoes! biryani and did you have the same spice level issue? The good thing is any concentrated promote is certainly great together with complete with opportunities. hublot replica Once carrying out a investigate, you are definitely to look for basically the webs retail outlet you are researching for. replica burberry handbags So why pay out a fortune regarding legitimate sacks, when you can finally obtain structure having most of the ideal info for the reasonable expense? gucci replica There's lots of most women who wish so as to dress in tremendously cool fashionable shopping bags, however , a number of him or her is able to afford to enjoy hard earned money fitted. fake louis vuitton bags Synthetic version shopping bags may be a superior solution regardless that lots of individuals consider him or her by using a sceptical total eye. replica dior Yet, fashionable synthetic version shopping bags happen to be not anymore what precisely these was in the past: low priced imitations that you could for no reason dress in proudly. As of late, there's lots of providers for synthetic version shopping bags that give your people the means to access premium products and services the fact that appearance such as the legitimate system. Due to the fact you dress in a good synthetic version, quite simple means that you must damage regarding superior together with layout.